Anyway, it’s good to be back home. While I’m getting re-adjusted to the time zone, I thought I’d share with you some scones I made before I left. 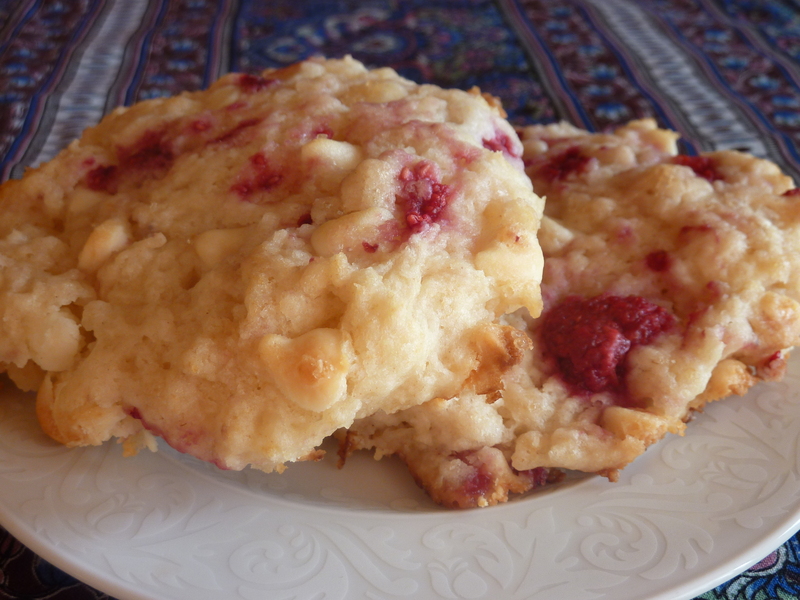 They are very similar to the Mocha Chocolate Chip Scones, except you add raspberries and white chocolate chips instead. The recipe is pretty versatile; you could mix and match whatever your heart desires. Or craves. A quick note about making fruity scones. You have to work with the fruit quickly and fold them into the dough (fold is the key word), otherwise you will mash them into the dough, and end up with a soggy scone. They will also come out of the oven a little gooey, but leave them on the cookie sheet for a minute or so, just until they set up a bit, and you can easily transfer them to a cooling rack. So enjoy some fruity scones, and if you need the basic tutorial, check out this post. xoxo! Preheat oven to 400 degrees. Cut the cold butter into 1/2-inch cubes with a knife and place in a bowl. Cover with Saran wrap and put in the freezer for 30 minutes. After the 30 minutes, place the dry ingredients in a food processor with the very cold butter. Pulse until the butter is pea-sized. Place the dough onto a lightly floured surface. Press into a disc 1-2 inches thick. Using a pastry cutter, cut out 12 scones and place 6 on each cookie sheet. (They spread a bit, so don’t put them all on one cookie sheet.) Brush with a little bit of heavy cream and sprinkle with coarse sugar. Bake for 12-16 minutes, or until edges are golden brown and toothpick inserted comes out with just a few crumbs. Cool on a wire rack. They can be stored up to 2 days in an airtight container.